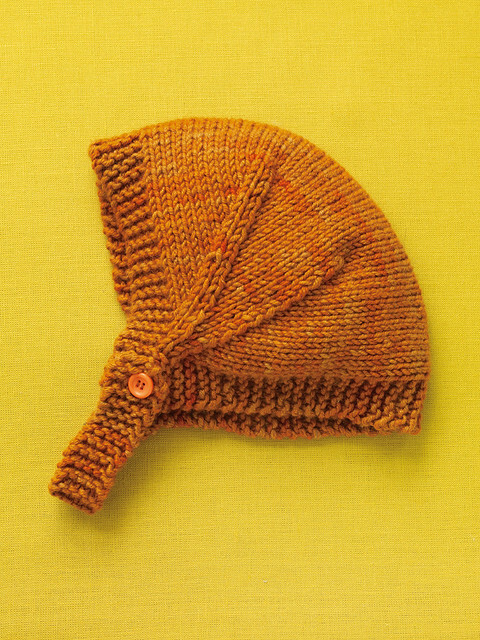 More Last-Minute Knitted Gifts is one of those books that makes you want to dog-ear every single project. Except you would never actually do that to your fancy new book. The author, Joelle Hoverson, is the founder of Purl Soho in Manhattan and if you've ever stopped by their blog, The Purl Bee, you know that Joelle and her team are a whirlwind of creativity. The projects in the book are divided up into five sections: less than 2-hour gifts, 2-4 hour gifts, 4-6 hour gifts, 6-8 hour gifts and more-than-8 hour gifts. I think this is especially perfect for new knitters who may not yet be able to gauge how long a project might take. 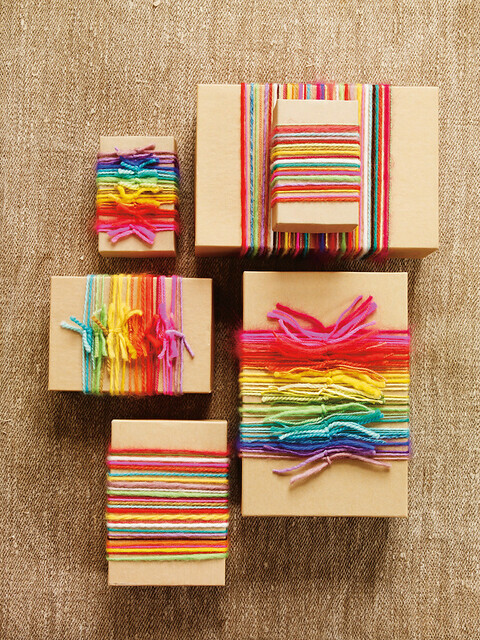 There is also portions of the book devoted to wrapping and personalizing your gifts. Something we all know is so important for our cherished handmades. 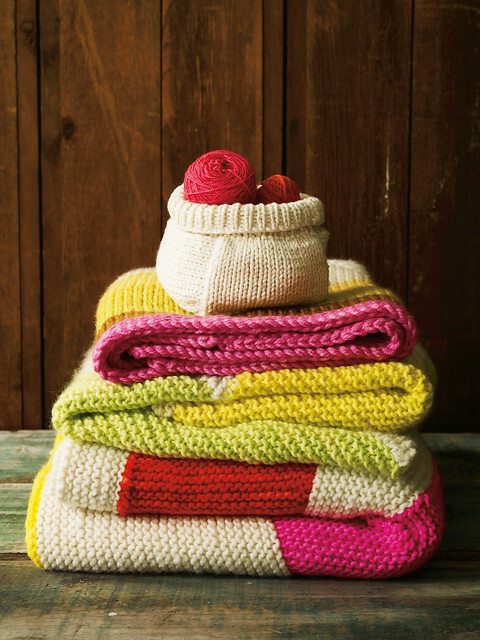 You know you can never have too many knit blankets and baskets. 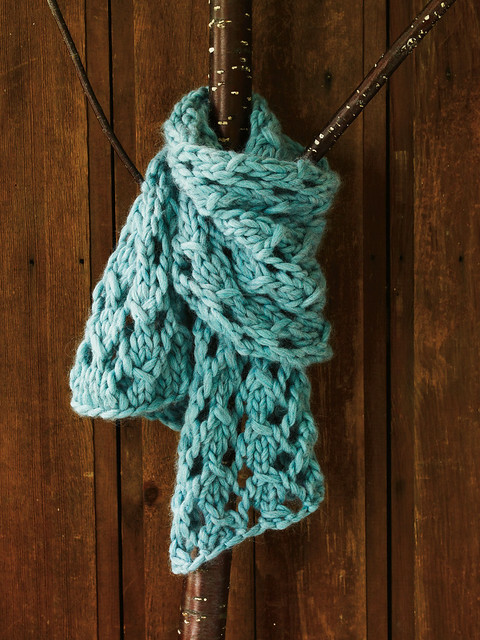 This scarf would look gorgeous on every single one of my friends. I have seven baby gifts on my list. One Narrating Life reader will receive a copy of More Last-Minute Knitted Gifts courtesy of STC. 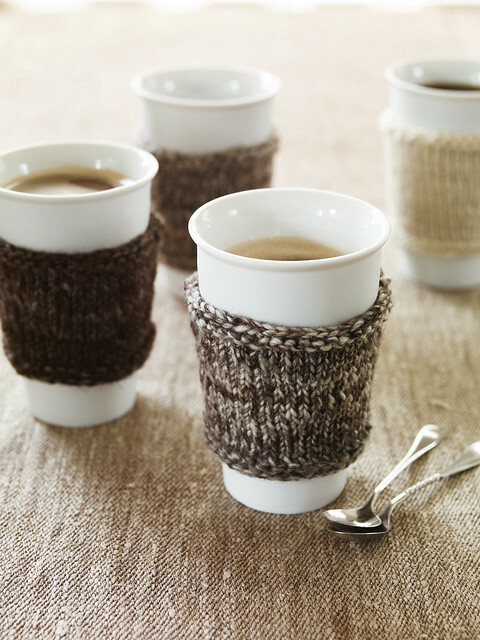 :: Check out the project gallery for More Last-Minute Knitted Gifts . 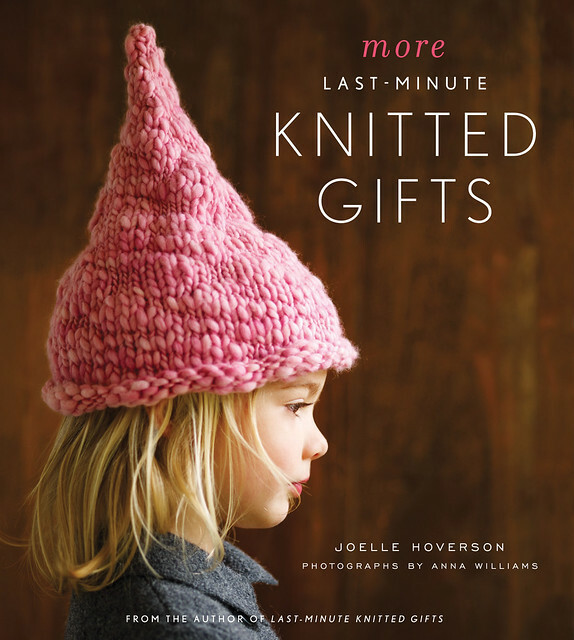 You can also browse Joelle's other books: Last-Minute Knitted Gifts, and Last-Minute Patchwork & Quilted Gifts. :: Comments close on Friday, December 10, at 10:00 MST. The winner will be announced on this post so be sure to check back to see if you've won. Congratulations, Greeneyes! Please contact me to claim your prize! P.S. Be sure to check the past giveaways posts to see if you're one of the lucky winners! OHH I have soo many holiday cookies, gingerbread, is peppermint bark a cookie??? My mom broke out her recipe for Nanaimo bars a couple years ago (that she'd just been sitting on! for like, 20 years! ), and I think I gained 10 pounds from eating nothing but those while we visited. I'm going to need to get it from her this year. Snickerdoodles! Best eaten warm out of the oven with a mug of chocolate milk (or coffee, if it's in the AM. Which...yes, cookies are indeed an acceptable breakfast, thankyouverymuch). I am horribly unlucky when it comes to giveaways, but I really REALLY want this. Am thinking about making each of my siblings enter for me. This book looks fantastic and that cover hat! Seriously cute. I'm sporting your button. LOVE this series! i love a good molasses krinkle. these projects are gorgeous! My kids love my chocolate oreo mint bark. They beg for it. I have browsed through this book before- it is so adorable! My favorite holiday cookies are my grandmother molasses cookies shaped in candy canes! Oh and I just posted the button on my blog- I don't normally like to do that but I really love this series, so cute! This book looks great -- would love to win! My favorite holiday cookie is my family recipe for cinnamon disks. A basic sugar cookie with cinnamon and walnuts. Perfect with eggnog! This looks like a great book! I love frosting covered sugar cookies best during the holidays. Want it! I don't think I have a favorite cookie, not having much of a sweet tooth. Does that exclude me? Hope not! My favorite holiday cookie is ginger snaps. I love sugar cookies! Thanks for the giveaway! In my excitement to enter the giveaway, I forgot to say my favorite cookie. For one who claims to be a foodie, I have a rather boring favorite: Oatmeal Chocolate Chip. Great giveaway! I'm not entirely sure Christmas would be the same without Berliner Kranser (Berliner Wreaths). Gingerbread is the best! But soft ... not the hard crunchy ones. My favorite holiday cookie is so simple...sugar cookies...there is just something magical about them...from childhood to now with my own children as there faces light up as we create sweet tasty goodness. That little gnome hat is adorable. Loved it on Zay. My favorite cookie would have to be the peppernut cookies that An would make at Christmas. Love them but very very very time consuming. Sugar cookies. Hands down no contest! Ohh, that wrapping photo has my attention! My favorite Christmas cookie is Shortbread. A dear Scottish Grandmother I knew gave me the recipe years and years ago. Ooh, this one looks fabulous! Too bad I didn't see it earlier. I just love cookies. Love them. Tonight I tried a new recipe: chocolate chip with peanut butter and pretzels. It's a keeper.